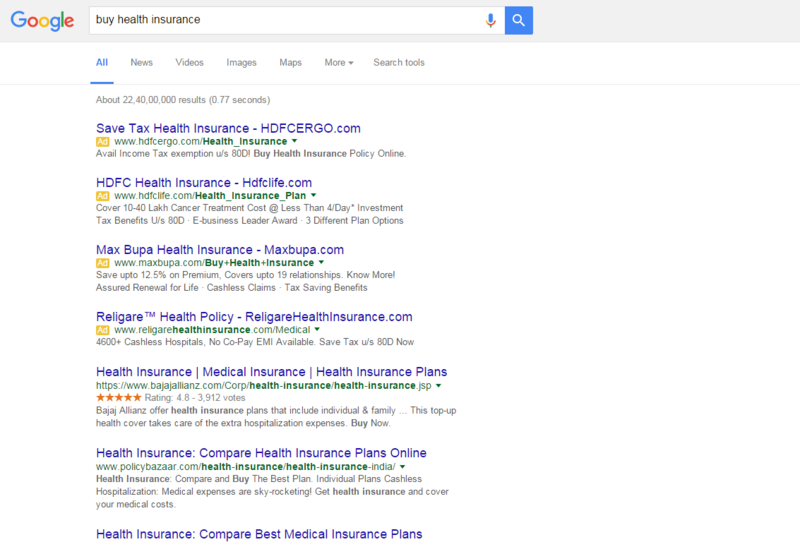 The battle for eyeballs on search results for Google adwords advertisers all set intensify! The hushed and talked-about Google Adwords strategy is about to become a reality. It’s Feb 2016 and as you read this post the implementation is in the final roll out stages globally. Infact we can see it already. Yes it is a change which will have a major impact for google adwords advertisers feel our team. Well, this has been long in the waiting and in some ways something was expected, Google has decided that it will no longer show ads on the right of its search results with one exception. So in the long run this step seems to be focused on better response for our advertisers but our delivery head Vibhas Sen believes that this is more in favour of the Search engine itself unless the search engine decides to pare down default organic search result numbers result or come up with a better relevancy matrix for advertisers to identify the irrelevant advertisers. Clearly for him and his team our clients ROI is top of mind. “Obviously this is tested over time and major ad categories would have delivered better results from such a format and thus the final decision” feels Sandiip Porwal who started Virtual Snipers with a vision to educate clients about the medium so more informed decisions could be taken. He added “This is a win for Google when it comes to organic search results. This new adview format means the search engine optimisation must be taken seriously by Indian businesses and they can no longer have shoddily coded websites with irrelevant content. This will augur well for Google as a search engine because the search users already have multiple options with apps and more time spent on social media. The search engine land article titled “Confirmed: Google To Stop Showing Ads On Right Side Of Desktop Search Results Worldwide” states that A Google spokesperson has confirmed that the change is now rolling out to all searches in all languages worldwide. Ads will not appear on the right side of desktop search results. What about Product Listing Ad (PLA) boxes ? For those of you running Adwords for Ecommerce and wondering about the future of the PLA ad format on Google Adwords the (good) news is that these ads will continue to show on the right of search results and also on top. The additional fourth ad if it does show up may only show above the search results for highly commercial queries, which apparently is to be able provide more relevant results for people searching and better performance for advertisers. At this point in time does sound like a vague broad terminology but we will know the nuances soon. Sandiip also feels, “there might a bit of a scare initially that CPC’s will skyrocket but it’s too early to jump to conclusions. Data over the next 4-8 weeks will talk. Personally I thing the timing might not be right for some businesses. This being the time when education institution Adwords campaigns, travel & tourism Adwords campaigns, financial services category campaigns are heading for their peak a spike in CPC’s could put immense pressure on marketing budgets and campaign performance in the short run. The elimination of right-side ads impacts all desktop searches worldwide thus the removal of all right-side ads obviously makes the desktop and mobile search results more similar. We will have more updates on this see soon, Keep watching….